Get a Life creator David Mirkin and the show’s writers (which included the then-unknown screenwriter, Charlie Kaufman, now known for the quirk and dark humor of films like Being John Malkovich, as well as Mr. Show creator and Better Call Saul‘s star, comedian Bob Odenkirk) would fool FOX by writing the kind of inoffensive scripts that they knew executives wanted to see. After getting the proper approval, they would proceed to change almost everything in the script to make it darker, weirder, and honestly more funny when it came time to actually film these episodes. This was one of the many reasons that FOX apparently HATED Get a Life. 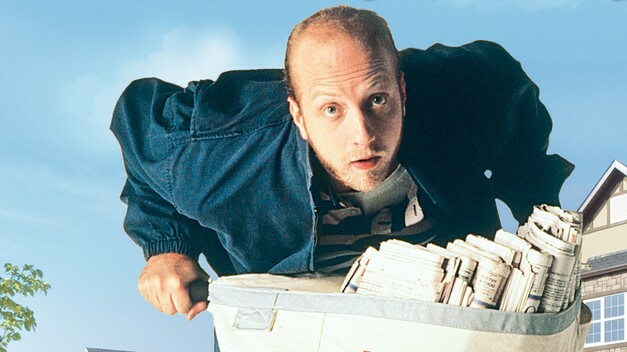 The story of the everyday life of a thirty-year old paper boy, Chris Peterson (played by comedian Chris Elliott), still living with his parents…is how one might try to summarize Get a Life. However, this does not really do justice to the bizarre 90s sitcom. Get a Life is one of those shows. You know? One of those shows that was cancelled after only a season or two by FOX, was watched by no one in its initial run, yet has attracted a small but devoted fan-base over the years. But unlike a show like Arrested Development, whose first demise stemmed from low viewership and a lack of patience from FOX, FOX never really understood Get a Life or cared to. From the episodes that I have seen and what I know about the show generally, it is very easy to see why FOX never liked the show. The surrealism of many episode’s plotlines, its over-the-top violent subject matter, and the progression of the show’s main character from likably off-kilter man-child to borderline psychopath was risky for a 90s television market. These very factors are what makes the show unique now. In fact, Get a Life is still one of the few network TV shows not only to have killed off its main character, but to have done it several times. Twelve times, to be exact. 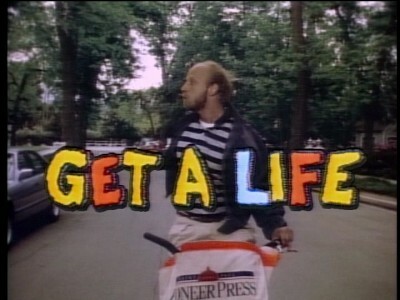 To be honest, audiences probably were not ready for Get a Life in its original run from 1990 to 1992, and a network like FOX will most likely never be ready for a show quite like it unless it happens by accident. The question is, “Does it hold up nowadays?” While references to the Nintendo Power Glove might not hold up all that well, Get a Life‘s humor has definitely passed the test of time. The show’s pilot, Terror on the Hell Loop 2000, opens with Chris Peterson (Chris Elliott) acting weird. One feels almost intrusive watching this weirdo do his thing. That is the best way that I can describe it. Peterson gets up, spews some weird jokes (“Man, I really shouldn’t eat Steakums before bed anymore”…hmmmm), exclaims, “Ah, man! I missed the new Fraggle Rock,” does some push-ups, dances crazily while brushing his teeth, stands up on his bed, makes out with a wall poster of Daryl Hannah, and then goes downstairs and talks to his parents. A corny sitcom conversation ensues between Chris’s archetypal grumpy dad (played by Elliott’s actual father) and doting mother before cutting to the show’s intro, featuring R.E.M’s most annoying song, “Stand”. I could technically keep track of what was happening throughout these first five minutes, but the fast-paced nature of this bizarre cheesiness made something feel very off. You should get used to this if you are going to keep watching Get a Life. You might be spending some of the time watching this show wondering what the hell the show was getting at comedically. Apparently, FOX made Mirkin use that awful laugh track used in all 90s sitcoms in the show, but Mirkin cleverly began to use it ironically and would write jokes that would use it for quirk value. The final product is very “Honey…where are my pants?”-esque. The show is certainly poking fun at the sitcom format, yet it is not a complete parody, often times seeming more like a homage. But fear not, viewer! The wonderful thing one will come to learn about the show is that it hardly even matters if the humor makes any damn sense, and for some strange reason, the comedic ambiguity is actually really entertaining because it keeps the direction of the humor unpredictable. The pilot’s plot follows Chris and his friend Larry, whom Chris peer-pressured into skipping work to ride the new 360-roller coaster at the local amusement park, getting stuck, upside down, at the top of the coaster. The most amusing bits are the subtlety unconventional ones. I do not want to ruin too many of the amusing little moments, but watch out for an especially funny gag that serves as a satire against the heartlessness of reporters. The laugh track laughs at the actual lines spoken in the gag, but the real humor of the scene is more subtle. Gags like this prove that there is more behind Get a Life than just pleasant silliness. Perhaps the most interesting thing that becomes apparent about the show through the pilot is that every character seems to be in a sitcom except for Chris. An example of this is when the Southern rollercoaster operator asks Chris and Larry angrily if they are “getting off” the rollercoaster, seeing as they have ridden several times continuously. Chris angrily responds, “Excuse your filthy mouth, sir” to the now-confused operator. Chris, realizing his misunderstanding of the operator, says something along the lines of, “Oh I am sorry, I thought you mistook my friend and I here for lovers and were making a reference to what we do in our own spare time sexually. My bad” following by a good-natured laugh. This kind of self-aware humor is what we see in shows like Community, Rick and Morty, and Parks and Recreation, shows that would come out years later. This kind of literal reaction humor is effective in an actual sitcom (so far) because Chris is the only one reacting strangely while everyone else remains a straight man. The pilot episode is only 22 minutes and there is not much too dissect plot-wise, and any more analysis would be excessive. For me, the thing that is apparent about Get a Life is how unexplainably likable it is. I felt at home watching it for some reason. Overview: The episode is entertaining on one watch, but a second watch yields clever details and my hope is that this will remain true for future episodes. The episode might seem a bit generic and odd, but if that does not affect if you enjoy this episode, then this is an enjoyable introduction to the weirdness of Get a Life. On the other hand, if you cannot get behind this episode’s humor, it is unlikely more episodes will change your opinion. This is not a show for everyone. Previous ArticleTV Review: Orange Is the New Black (3x07) "Tongue-Tied"
Next ArticleTV Review: Orange Is the New Black (3x08) "Fear and Other Smells"